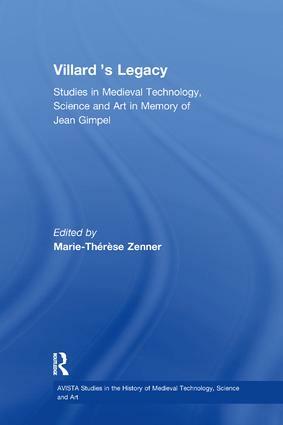 Villard's Legacy is in memory of the celebrated iconoclastic historian, Jean Gimpel, and represents a fundamental contribution to the new AVISTA series with Ashgate Publishing. AVISTA was the brainchild of Gimpel, a genius at making the right people meet to advance knowledge through a confluence of ideas drawn equally from the practical and scholarly domains. Sixteen papers and a tribute to Gimpel underscore this confluence of technology, science and art within medieval culture. Appropriately, six papers offer new interpretations on aspects of Villard de Honnecourt's portfolio, which Gimpel rightly recognized and promoted as a unique and precious record of pre-modern technology and culture. This thirteenth-century manuscript is now known to a wider public as the earliest testimony left by a master builder in Gothic Europe. Of particular significance, for the first time in eight centuries, a Compagnon du Devoir, initiated in the same oral tradition as Villard, opens the door to interpreting these remarkable drawings. Three papers address previously ignored aspects in the construction of French and English Gothic churches, from the engineering of aerodynamic spires, to the elastic materials of vault webbing, to the social conventions of formal design. Three other contributors treat essential elements of a broader technological culture, such as the horse harness and the minting of coins, as well as the applicability of medieval technology to the modern world, in particular third world countries, a project pioneered by Gimpel. Four papers conclude the volume by treating the sciences of measure and their cultural expression in medieval Europe, embracing both the concepts of space and time, geometry as a mathematical discipline, and the graphic expression of scientific data. These interdisciplinary studies are comprehensive in chronological and geographic range, extending from the 8th to 15th centuries, from Ireland across Europe. Contents: Introduction, Marie-Thérèse Zenner; In Memoriam Jean Gimpel, 1918-96, Carl F. Barnes, Jr.; Essay: Jean Gimpel and the legacy of medieval technology, Charles Stegeman; Bibliography of Jean Gimpel; Portfolio of Villard de Honnecourt, selected folios. Part I Art And Architecture: Architectural geometry and the portfolio of Villard de Honnecourt, Nigel Hiscock; Reims cathedral in the portfolio of Villard de Honnecourt, William W. Clark; Villard de Honnecourt and masons' marks, Jennifer S. Alexander; Costumes in the portfolio of Villard de Honnecourt, Janet Snyder; The oral tradition and Villard de Honnecourt, Renaud Beffeyte; The saracen's sepulchre: an interpretation of folio 6r in the portfolio of Villard de Honnecourt, Roland Bechmann; Rock, spires, paper: technical aspects of gothic spire construction, Robert Bork; The use of tufa webbing and wattle centering in English vaults down to 1340, Malcolm Thurlby. Part II Science And Technology: The medieval horse harness: revolution or evolution? A case study in technological change, Paul J. Gans; Technological innovation and control at the medieval Venetian mint, Alan M. Stahl; Astronomy, time, and churches in the early middle ages, Stephen C. McCluskey; The art of radically coherent geometry, Robert D. Stevick; Euclidean geometry in the early middle ages: a preliminary reassessment, Wesley M. Stevens; Diagram and thought in medieval science, John North; Index.